Loose seat cushions, boxed with cord trim. 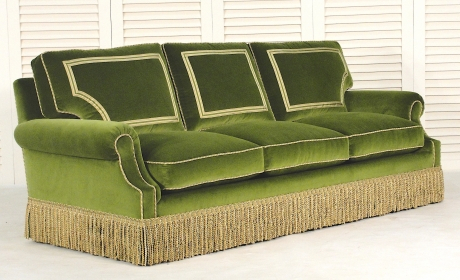 Loose back cushions, boxed with cord trim and braid trim applique. The fill is 50/50 Down/Feathers with a foam core in seats. Frame is detailed with cord trim. Bullion fringe applied over skirt.